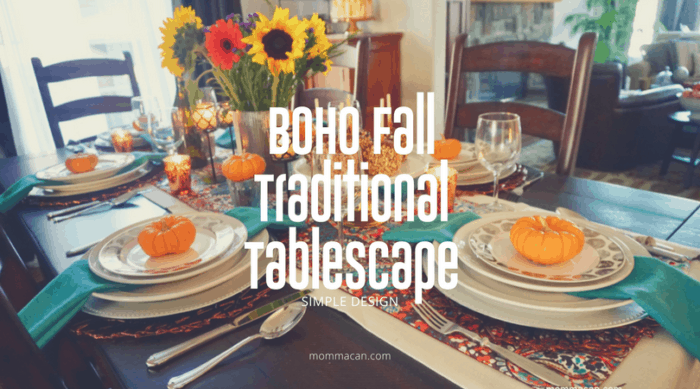 Hi friends, I am excited to share with you a BOHO Traditional Colorful Fall Tablescape. I had been hankering for weeks to create something fun and budget-friendly and finally finished this past weekend. I chose bright rich blues and oranges and coppery accents. Lots of sparkly candles and mini-pumpkins added to the charm of the table. 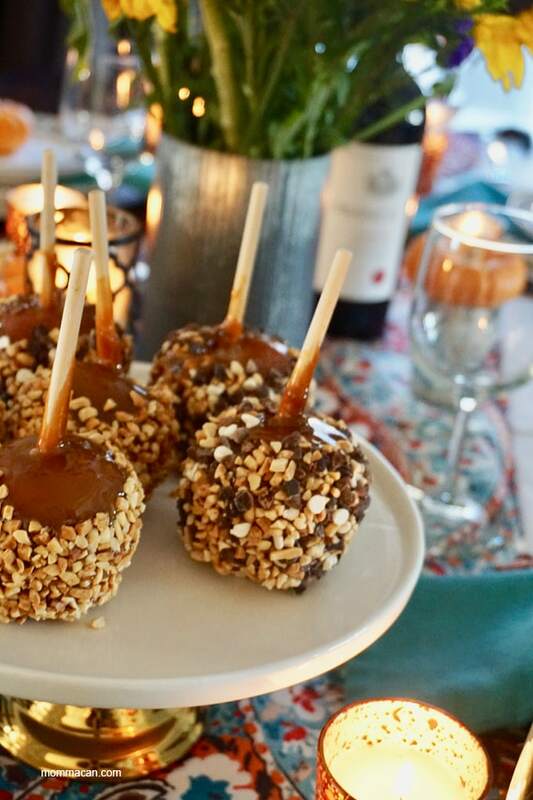 Caramel apples and a caramel cake make our colorful dinner setting even more enticing. Well, I am going to stop chattering now so you can enjoy the photos! 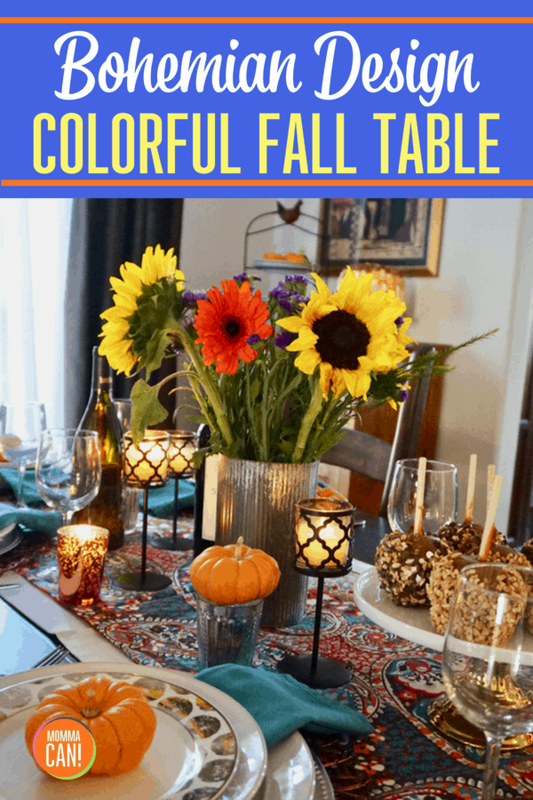 My inspiration for this colorful tablescape came from a magazine. A gorgeous printed tablecloth draped over a roundtable in an outdoor setting with a pretty impressive barn in the background. Alas, I had no farm, no barn, and when I checked the price of that tablecloth I nearly fell on the floor. 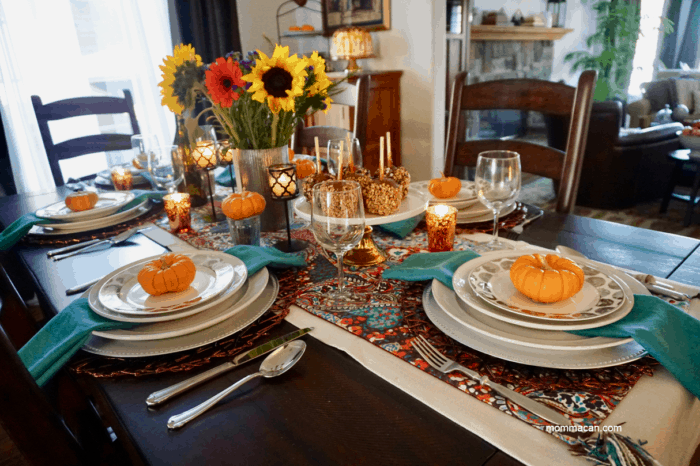 But the seed had been planted, I knew that I wanted to design an affordable fall tablescape that would capture the vibrant hues of the front page of that magazine and wow my husband with my fabulous budgeting skills for family gatherings. I started creating a plan of how to get find the equivalent of that fancy pants tablecloth at my local haunts. Fondly referred to as the Homegoods hunt, but I also hunt at Target, TJMaxx, Marshalls, Pottery Barn and Williams Sonoma. If I have a fantastic coupon or Kohl’s cash to spend I will check them out as well. When you are hunting for that ONE thing to make a beautiful table it can become quite an obsession. I looked for that perfectly patterned tablecloth for weeks. I even browsed the fabric stores and bedding to see if I can make one as a DIY project. But nothing I could find really felt like it was the ONE until I hit a lucky streak. Pumpkin Spice Latte and Invoking My Inner Star Trek Geek! 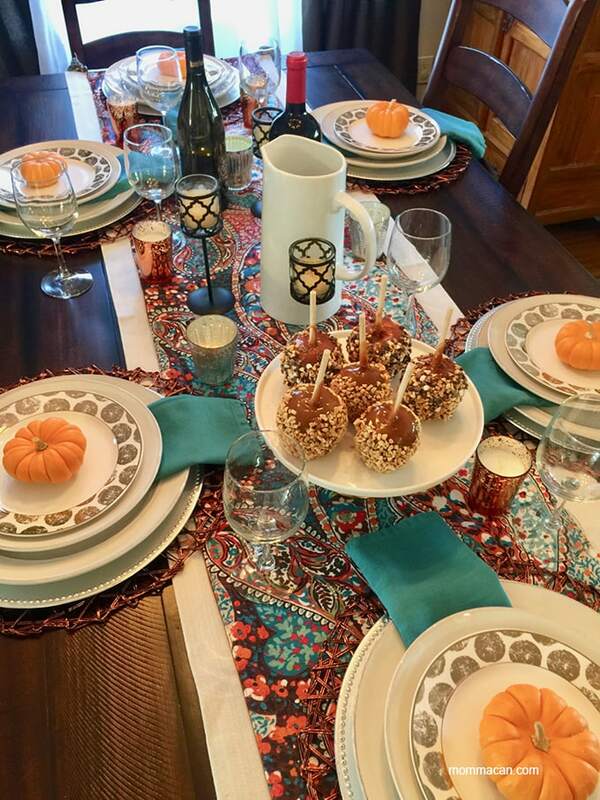 My lucky streak started with a trip to Starbucks for a Pumpkin Spice Latte as a design/decorating beverage to sustain me during my quest for the perfect fall tablecloth. I timed my purchase so that it sits in the cupholder for the exact amount of time it needs to call off to be sippable ready for my Homegoods fun. I pop out of the car because I can just feel that today is the day and grab the nearest cart and beam myself through those doors with an energy similar to Scotty excited to tell Captain Kirk he has saved the Enterprise again. Walking the aisles I finally spot her, THE ONE. She is not the perfect rectangle with the perfect pattern of jeweled tones and whimsical golds of my dreams. But when I pull the beautiful warm coppery, orange, turquoise and red table runner off the rack I am completely smitten. I immediately turn the price tag up to my fearful eyes and breathe a sigh of relief. My inspiration tablecloth was over $150 and this gem was a whopping $12.99. 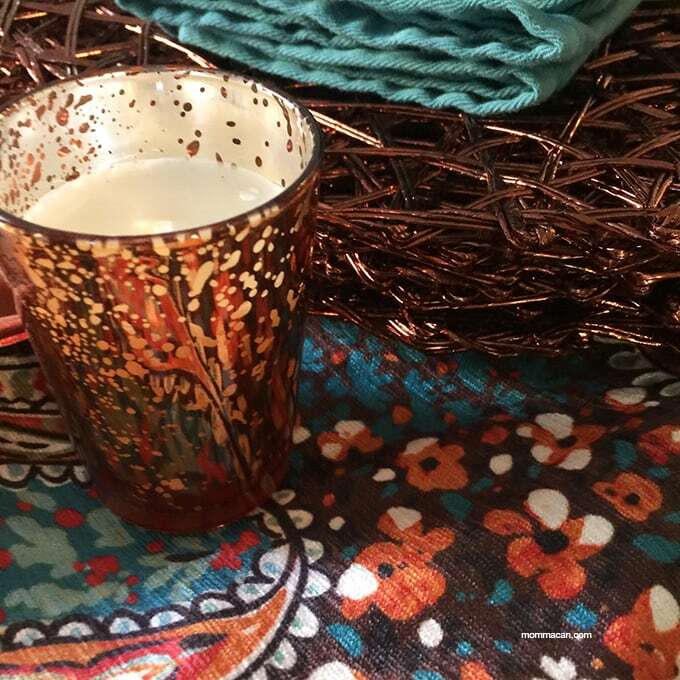 I turn around thinking accessories and find the perfect set of copper placemats and turquoise napkins. And utilizing my mom Target skills, I recall seeing copper votives during my last trip in the dollar bargain section at the front of the store! This table is coming together at an alarming rate and I am not breaking the bank. The placemats $5.99 and the cloth napkins $4.99. I returned home from my shopping expedition with a burst of unheard of energy for a busy working mom. Grabbed the table runner only to discover that it was too short for our new table, a gift from the in-laws. 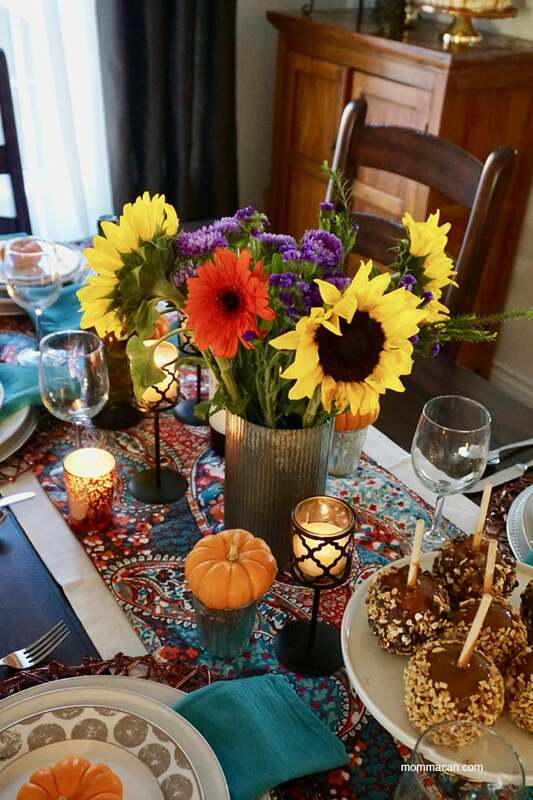 I was so disappointed because I just loved that beautiful table runner and all the trimming I had gathered to create the PERFECT fall BOHO table. Oh My Darling, How You Sparkle! My quick trip paid off. I found a set of six darling bread/dessert plates with the beautiful sparkly polka-dotted rims. It was like they were made for the tablescape. I also found a set of blue patterned plates (but that is another table and another story) Homegoods, you are my busy mom hero! I just love the way it finished the place setting. I will cherish these gorgeous plates forever! 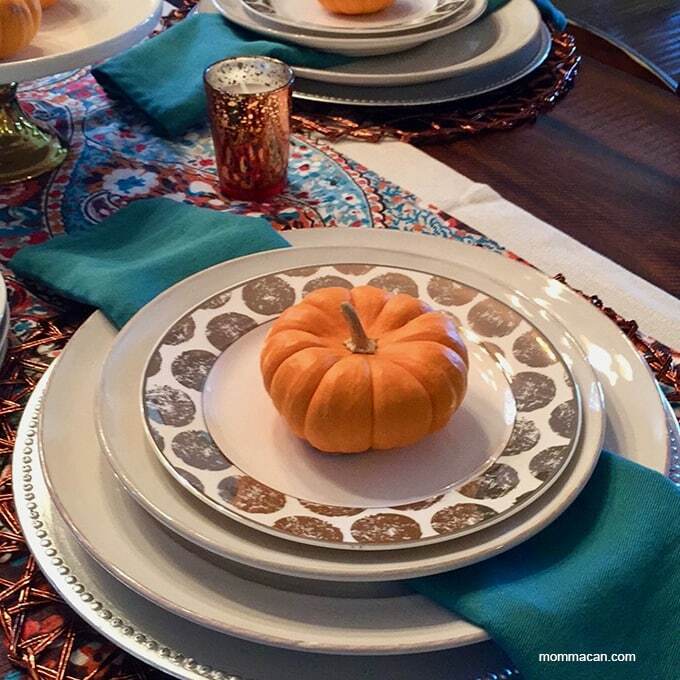 Nearly finished with the BOHO Traditional Colorful Fall Tablescape! 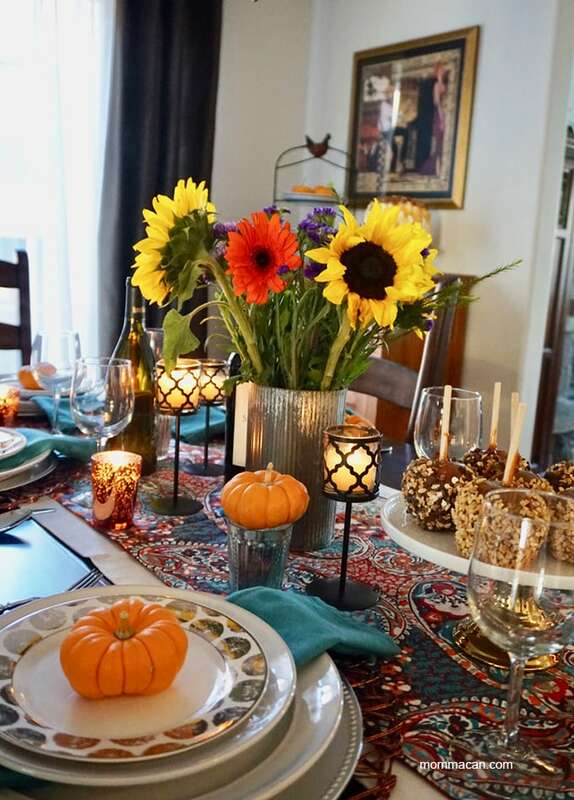 The finishing touches, a sunflower bouquet in a farmhouse style aluminum vase that I had stashed under the sink along with mini-pumpkins and fun caramel apples for visual interest. I also grabbed some black metal taller votives that I sue ALL THE TIME. Who loves caramel apples? You should have seen my teenager circling the table waiting for me to finish taking photos so we could eat! I also placed the tiny pumpkins atop some mercury glass votive holders to give them a little height. And Bam! Wine glasses and some good wine and we were totally finished. I just needed to grab my big glass pitcher of yummy pear, berry and cinnamon infused water and we would have our little family party. This was infused water is so yummy! Just cube three seeded pears, add a few berries, and whole cinnamon sticks! It really was an adventure finding my inspiration and shopping for the little bits to make it all come together. I always have my basics on hand, white/nearly white dinnerware, stainless steel flatware, clear glasses for wine and drinks along with my collection of floral containers and cake plates. With these basics, I am able to complete a new look with little odds and ends from bargain shopping at a very low cost. This table was a bit more than my normal fifty dollar budget because of the purchase of those plates at $3.99 each. My tablescape cost just under 60 bucks! That includes the flowers and mini-pumpkins. What a gorgeous tablescape! I love the warm colours and it all looks so inviting! 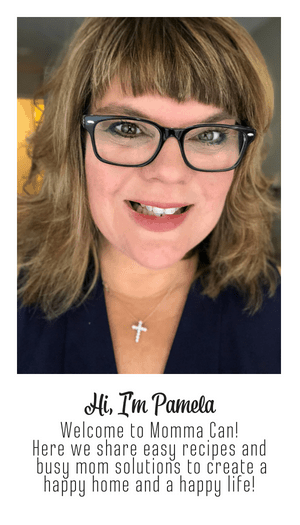 Visiting from the We Are Pinnable Party. Pinned. 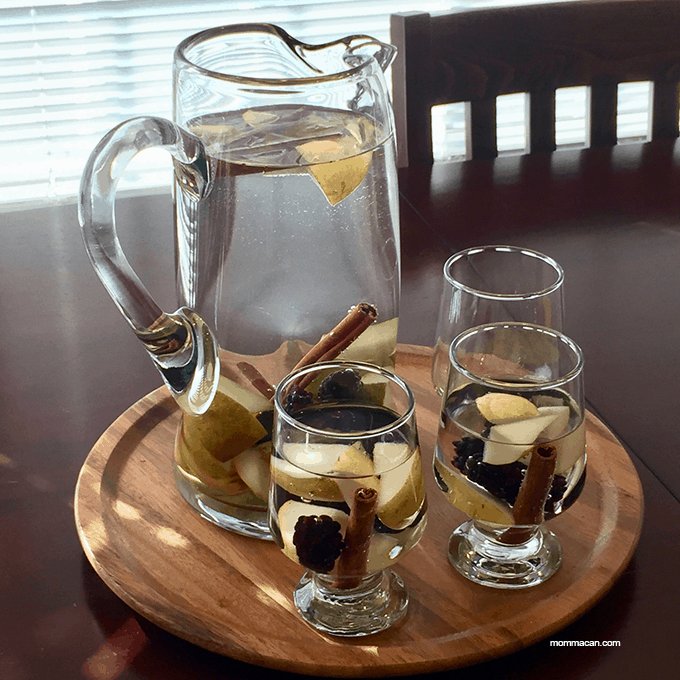 Love the infused water recipe – that sounds so good! Loved the glimpse of your table we saw on Instagram. Really enjoyed reading about the trials and tribulations to its creation. 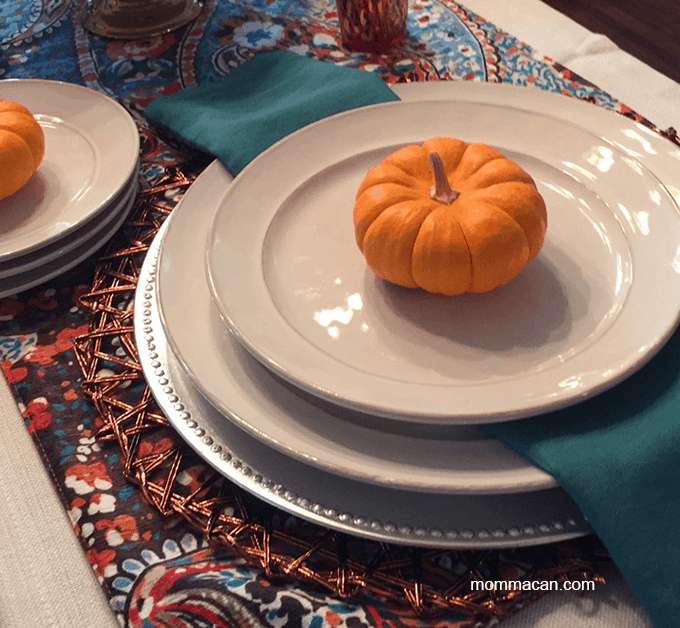 My favorite, aside from the table runner, are the little pumpkins! Great idea that says ‘autumn’ without knocking you over with leaves and acorns. Perfect touch. 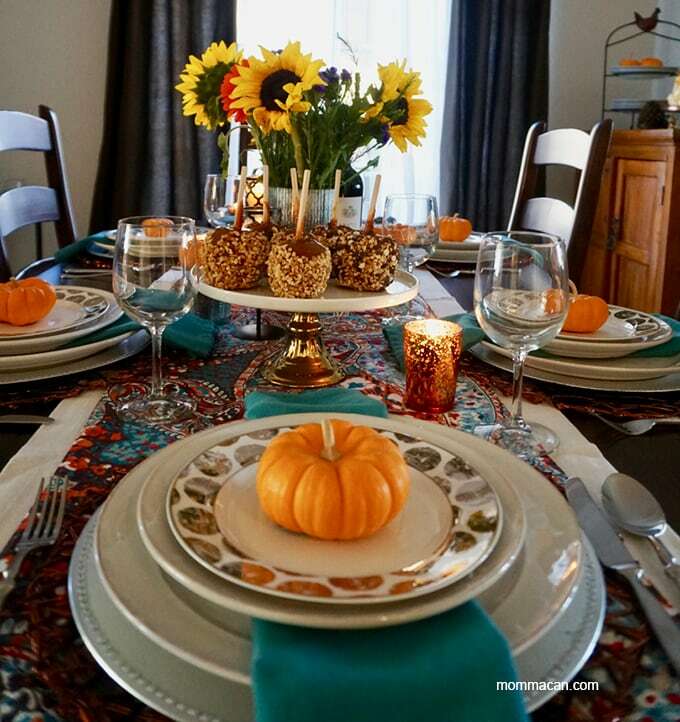 I think your table runner is gorgeous Pam perfect Boho chic and I love your table setting – magazine worthy !! Wow your table is gorgeous. Its so well done and now I want a candied apple no wonder they were circling the table waiting for it. Everything looks wonderful. Pinning.